Yesterdays official Test Day at Le Mans was supposed to have given Aston Martin Racing eight hours of available track time to establish their three GTE entries ahead of next weeks 24hour race - instead they faced a team disaster as two cars were soon consigned to the 'scrap heap' even before the day was half out. With the #98 GTE Am entry for Paul Dalla Lana, Pedro Lamy and Mathias Lauda being an old hand at this LM24 thing and having been around the circuit many times in years gone by, yesterdays test was the first time the team's new turbo charged Vantage GTE Pro had been to the circuit in this years FIA WEC Super-Season so the job lists would have been extensive, laborious and very time consuming. 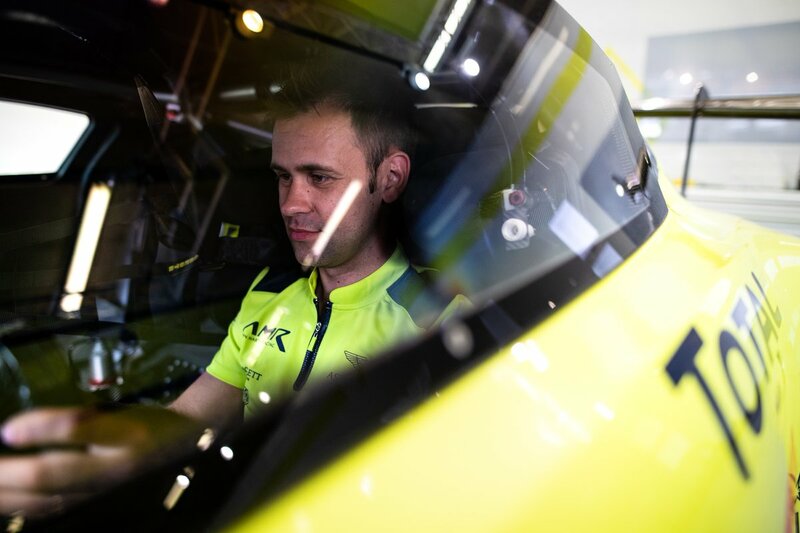 With all GTE Pro drivers present for the test at least that work load could be shared as the two cars split test strategies with six times the level of input being available from the Pro drivers to the backroom technicians. 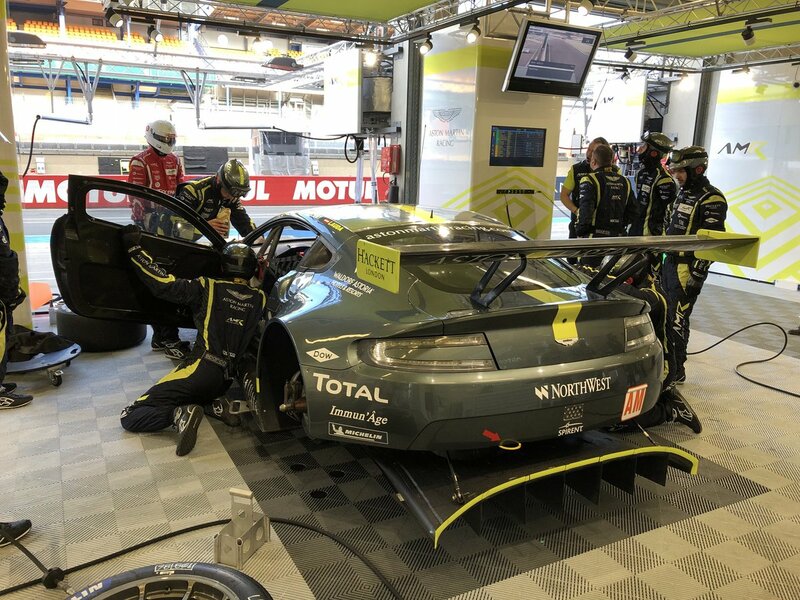 Joining them in the neighbouring garage was TF Sport who's #90 V8 Vantage GTE would be entering its second Le Mans race, this time as part of their WEC full season entry and would again be driven by Salih Yoluc, Euan Hankey and Charlie Eastwood. 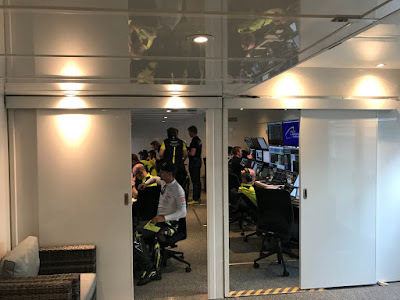 For them, the test would allow them to cycle through their own test schedule (separate to AMR) and without any significant incident which was all good news for them. Under the clear skies with high air and track temperatures things were looking pretty good for a productive test day for the sixty entries along pit row and in typical AMR style, there was no rushing to go anywhere quickly - instead their methodical and progressive stance, always taken by the team in these conditions, became very obvious from the timing screen. A slight electrical hiccup was soon dealt with aboard the #97 car before Lynn was waved off on his first Le Mans laps with the team as he joined Marco Sorensen in the #95 and Lamy in the #98 on track. 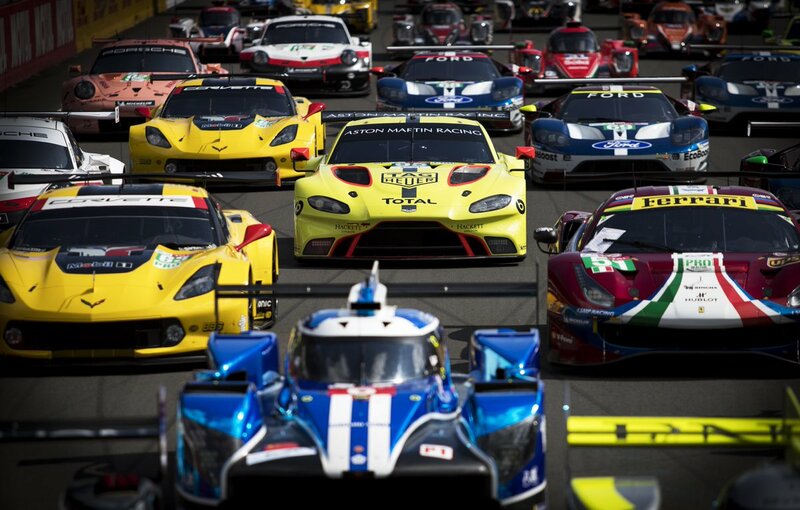 Yellow flags, safety cars, slow zones and even red flags are no strangers to any test day event and Le Mans yesterday was no exception as drivers and machinery refamiliarised themselves back with the new track characteristics of the Circuit de Le Sarthe after recent changes. AMR drivers who had already ran there first stints on track reported back to the teams new (for 2018) 'command hub' now located to the rear of the garage complex rather than in the garage box itself. 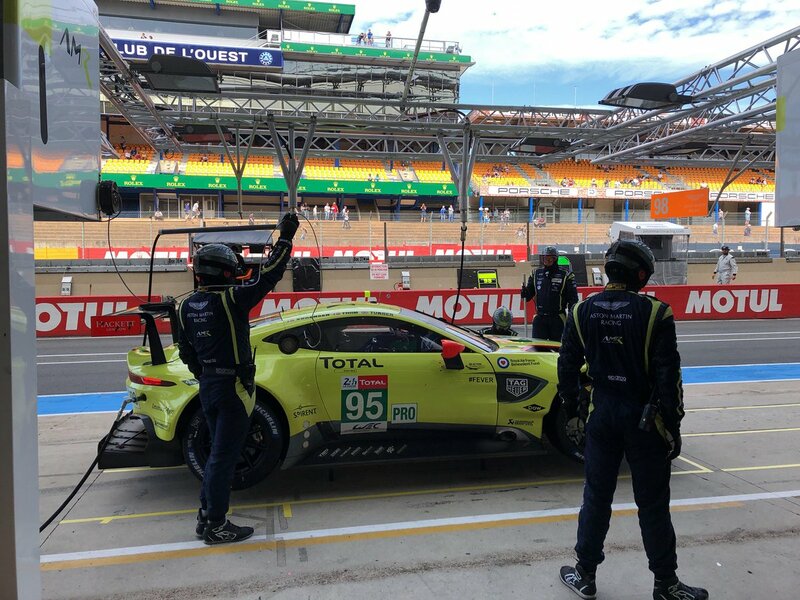 By mid morning of the first session, Darren Turner was the fastest AMR runner with a 4:00:046 but that was slower than some GTE Am cars as both the #95 and #97 remained at the bottom of the GTE Pro class for the whole session - but then, bedding in new disks and pads isn't exactly the fastest way around any track and that was one housekeeping rule AMR always do first at the test. Trouble for the team was however just around the corner and in relatively quick succession as track marshals first reported oil on track with then a hobbled #98 car making its way very slowly back to its garage before reports came in of a serious incident at the far end of the track involving an LMP2 and the #95 AMR with Marco Sorensen aboard. Whilst the crew of the #98 carried on with surveying the damage to their car, concerns rightly turned towards its sister car as the series medical and extraction teams were dispatched to site. Fortunately, news from the team regarding Sorensen's state of health was good other after his mandatory trip to the medical centre but news on the car would have to wait until later but it wasn't looking good on that front! 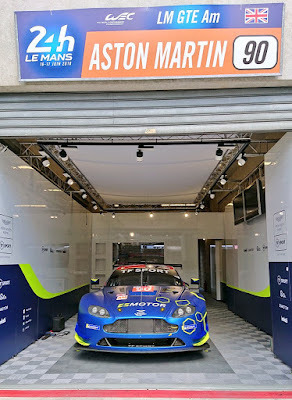 With Sorensen's accident having prematurely curtailed the morning session to allow for barrier repairs came the somber sight of two AMR garage doors being lowered to signify the cessation of those car's participation in the event - it was all beginning to go wrong for the boys from Banbury. Later inspections of both cars during the afternoon session and going into Sunday evening reported the #95 car as indeed being beyond repair and that the spare chassis (chassis #4 that we saw being fabricated at Prodrive earlier in the year) would have to be brought into service. The #98 also required a significant amount of repair as the kerb had cracked the engine sump along with other structural damage - all too much to be achieved in the four hours of the afternoon session and to a point of where team members were dispatched back to England in order to obtain spares for both injured cars. That handover, we understand was made at Folkstone before an overnight dash back to Le Mans for the team to get to work early this morning. Even by late afternoon today both the #95 and #98 remained in an incomplete state as the team hurries to prepare the cars for a shakedown test tomorrow - whether that is along the neighbouring airfield or on the Bugatti circuit we do not know but we are sure that we will find out soon enough. 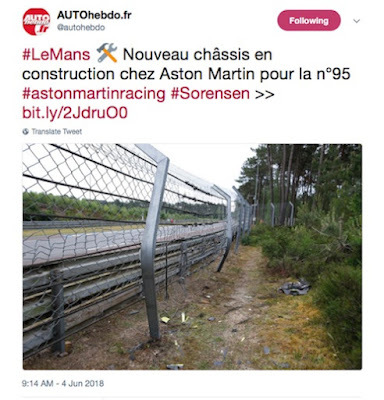 Photos coming out of France today (above) show the severity of the impact of the #95 had with the safety fencing and proves that the situation may have been worse had the catch fencing not have been where it was! For Aston Martin Racing or any other team for that matter, having one car damaged would have been a set back but for two cars extensively damaged was nothing short of a disaster. Whilst the cars would have been stripped down and rebuilt ready for the 24Hr anyway, the phycological impact of such and event will be them on the back foot and everything will feel like they are playing 'catch up' and that is before you consider any on track performance deficits!! 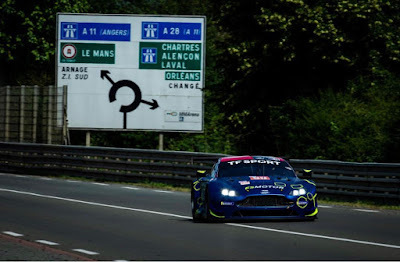 The actual performance of the new Vantage GTE on the Le Mans circuit has still to be quantified for ultimate pace - never to reduce the five second gap to the pace to the leading Ford over the course of the Test Day must be something of worry unless its rule 12 of John Gaw's game plan in action of course?!?! 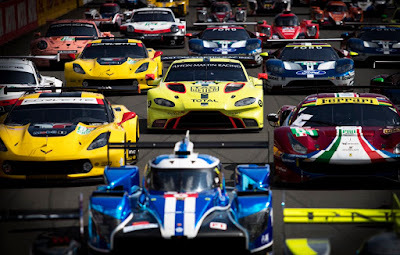 With drivers Nicki Thiim, Marco Sorensen, Darren Turner and Maxime Martin all on British GT duty again this weekend coming (and many already having returned home) we may get to see Ross Gunn being called up to help the team deal with the immediate consequences of these incidences! Whilst none of the has been good - the team are certainly not out of anything as Jonny, Darren and Daniel found out last year - its being the first to cross the finishing line that counts most!! !